Dr. Avitzur, a neurologist in private practice in Tarrytown, NY, holds academic appointments at Yale University School of Medicine and New York Medical College. She is also the editor-in-chief of the AAN Web site, aan.com. The new recertification process has generated much confusion and speculation among practicing neurologists. Admittedly, my first inclination was to ignore the whole thing, having been grandfathered before Oct. 1, 1994, when those achieving board certification by the American Board of Psychiatry and Neurology (ABPN) began to be issued 10-year, time-limited certificates. But it turns out that it's more complicated than that. Although those of us holding lifetime ABPN certificates may not be required to sit for more exams voluntarily, we may have to adhere to other elements of the guidelines. It's also likely that relocating to another state may require that we take a cognitive exam to get licensed. Here's what we know so far. There has been growing pressure on the medical profession to reduce medical errors and to ensure that physicians demonstrate competence and expertise. If the neurology community does not develop mechanisms to accept this responsibility, organizations such as the National Skill Standard Board, a federal agency, may step in, and dictate their own requirements and metrics. The American Board of Medical Specialties (ABMS) contends that the Maintenance of Certification (MOC) program will address these concerns. “In fact, the ABMS requires that all specialty boards — including the ABPN —participate in the MOC so that they may continue to certify their members,” explained AAN Education Committee Chair Ralph F. Józefowicz, MD. “The ABPN, in turn, has asked the AAN to provide materials to help neurologists satisfy MOC requirements,” he said. The 10-year MOC program, which replaces the current recertification process, released new guidelines this year on Sept. 29, including four components: Professional Standing; Self-assessment and Lifelong Learning; Cognitive Expertise; and Performance in Practice. Neurologists must hold a current and unrestricted medical license to practice medicine to provide evidence of professional standing. For the self-assessment and lifelong learning requirements, neurologists must participate in at least two broad-based self-assessment tools in which they answer a total of 200 self-assessment questions and complete 300 specialty-specific, Category 1 continuing medical education (CME) Credits™ over the 10-year MOC cycle. These components were phased in earlier this year, mandating that neurologists produce evidence of completion of at least 100 self-assessment questions and a minimum of 30 specialty-specific Category 1 CME Credits™ on their application for the 2007 cognitive examination. An additional 30 CME credits will be required in each upcoming year. Neurologists must pass the ABPN multiple-choice cognitive (recertification) examination prior to the expiration date on their certificates to demonstrate cognitive expertise. The performance in practice component is intended to assess quality of care and ensure that methods to improve care include follow-up evaluations. Three cycles must be completed in 10 years: clinical modules including chart reviews with comparison of data to best practices/practice guidelines, and feedback modules providing performance feedback concerning improvement in effectiveness and efficiency. ABPN diplomates are responsible for choosing their self-assessment, lifelong learning, and practice improvement components, and maintaining records of their self-assessment and CME activities, as well as performance in practice modules. The MOC program will be in full swing by 2016, at which time attestation to all components will be required. “The Academy is working in earnest, in consultation with the ABPN, to create educational modules that are comprehensive and streamlined to provide members assistance meeting these requirements,” Dr. Józefowicz told Neurology Today. The latest program created by the Self-Assessment Examination (SAE) Work Group of the Education Committee, led by Glen A. Fenton, MD, is the online Neurology Self-Assessment Examination (NeuroSAE) designed specifically to help neurologists assess their knowledge of clinical neurology. A 100-question examination, the NeuroSAE counts as one complete self-assessment activity in the MOC program. Gamal S. Boutros, MD, who specializes in pain management, decided to take the AAN NeuroSAE even though he became board certified in neurology in 1992 and is not required to take recertification examinations. He thought it would be helpful to test his general knowledge in neurology. Dr. Boutros viewed this as an opportunity to study, and checked his answers as he went along, completing it in about four hours. “It was easy,” he reported, admitting that he looked up eight questions on PubMed and in Neurology. The NeuroSAE, which covers 20 specialty areas, may also be taken as a timed test with feedback and suggestions for further reading upon completion. Aaron Miller, MD, editor of Continuum, believes that these resources serve as an ideal vehicle to supplement clinical practice, maintain certification, and prepare for the MOC program. “The topics are highly clinical reviews of subjects that one regularly encounters in practice and may expect to see on the examination,” Dr. Miller said. Continuum, offered six times a year, has been available online to subscribers since February 2007; Quintessentials is offered twice a year and is entirely case-based, linking to current Continuum material. The ABPN has also approved the following AMA PRA Category 1 Credit CME activities as part of a comprehensive lifelong learning program: AAN Fall and Winter Conferences and the AAN Annual Meeting Education Programs. 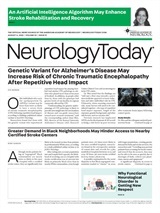 Online Neurology journal CME at http://cme.neurology.org. Multimedia Reviews of key articles from Neurology and related journals, available on audiocassette, audio CD, and CD-ROM. The AAN generated CME credits are aggregated for members and may be tracked online at AAN.com; CME transcripts may be downloaded at: aan.com/professionals/cme/index.cfm. Neurology Today7(24):24-25, December 18, 2007.